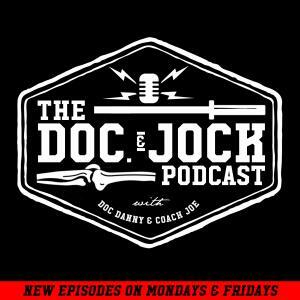 On Episode 179 of The Doc and Jock Podcast Coach Joe sits down to share his thoughts on how be successful training at home. Having a garage gym is great. The time you don’t waste in the car alone traveling to and from the gym makes it worth having. That said, to successful train in your own garage set up you need to have few rules in place. 1 - Figure out a home set-up to train at home and do it in front of your kids if you have them. If you train in front of your kids the perception will make them want to be fit. 2 – Carve out a designated space. Your gym space needs to be your gym space. This needs to be the place you get work done. I am a big fan of a compartmentalized place that is just for training. We don’t even park the cars in the garage. Now, we do store some things in the garage along with the training gear but the matts are for training and that is that. If you don’t have the space to carve out your very own training place, but do get after it at home, I would suggest setting up the same way, in the same place, all the time. My wife for instance likes to do yoga in the living room with the kids. When she does this she does it in the same spot and has a routine for setting that up, but more on that later. The point is your at home training space needs to be as consistent a training place as a stand along gym as possible. This will ensure for more consistent training. 3 – Have a pre training routine. If you are going to be training at home you need to set your switch and hit the go button! Regardless of the amount of time I have to train or the type of training I am going to get into I do a few things beforehand to set the mood. My routine consists of writing down my work, informing my little ones that daddy is hitting the gym, and setting my computer up for tunes. Yes, these are really simple things. But, they also ready my mind and my kids for the training session to come. I mentioned above that I like to have my kids around when I hit the weights. Check out this video from a recent session and you will see my son is a few feet away as I perform a Jerk variation. Inevitably misses happen and unpredictable events take place. Never, not once, or ever is one of those events allowed to be one of my kids getting hurt. In order to keep my kids safe while I’m moving heavy loads the kiddos know, and I check to make sure they are out of danger. One rule is that when Daddy is training kiddos have to be on the other half of the garage or off the training mats. As you can see Mason understands this and stays clear. Be sure to have, and most importantly, enforce ground rules for the safety of participants and nonparticipants. Now this rule is for those of us with kiddos at home while training is going down. It may also apply to a spouse or frisky friend so be sure to still pay attention if you don’t have kiddos. I don’t go out of my way to schedule events for my kids when I train. As I mentioned before I want them around training, plus I want them to take care of their own business and be independent – which mine are. I see parents over schedule, over stimulate, and underestimate their child’s ability to fill time – all the time. If you do any of these things your kiddos will be dependent on you to get through every minute of the day and that will inevitably eat up your training time. On the other hand, don’t schedule anything. Don’t lay out extra stuff. In fact, don’t go out of your way to set up anything to keep your kids busy at all. I think you’d be surprised at how well they will fill in the gaps. I am fortunate enough to have three kids close in age. Mason is 6, Charlie is 4, and Luci is 2. These 3 play very well together because they spend a lot of time playing well together! And yes, they play with each other. When Daddy trains that is not code word for movie time. When Daddy trains that does not mean the iPads come out. Take the drawing of the New York skyline that Mason created yesterday. The only hand I had in the creation of this picture was taking the picture and providing the freedom for him to be creative. While he did this he also pulled out a few extra crayons and pieces of paper for his little sisters to create as well. The major takeaway is when Daddy trains that is his time, but it’s also the kids time! They can play, train, create, and figure out how to manage themselves quite well. That said, these are still little kids. They can’t manage themselves for hours. Give yourself a time frame so you can truly be productive. Our house is not Lord of the Flies. 60 minutes tops is what my kids get to be independent! Not to mention when they are in that state I am a door away and constantly checking in! If you don’t have a garage or home set up I would highly recommend it! I would also highly recommend coming up with a system so you can train productively. Mine is simple. I Carve out a space, I set the stage, I have some rules, and I make that time productive by making it mine. If you train at home I’d love to know what your system is. If you don’t train at home try mine and let me know what you think. Comment below, give this a share, and check out my free download below of you are new to Weightlifting or need help dialing in the fundamentals!